The great thing about PC gaming hardware is that there's so much choice. You aren't restricted to certain peripherals, and there literally is a keyboard or mouse to suit every individual. The only thing you need to be wary of is cost, as while the entry point tends to be low, prices can spiral out of control for high-end equipment that casual users aren't likely to need. When it comes to gaming mice, the likes of the Asus RoG Spatha and Fnatic Gear Clutch look tempting if you're willing to splash large amounts of cash, but if cost is a key consideration, Corsair reckons it has a noteworthy alternative in the form of the Harpoon RGB. Introduced to market with a palatable £25.99 price tag, the Harpoon RGB is one of Corsair's most affordable mice to date and serves as a cost-effective option for the casual gamer. 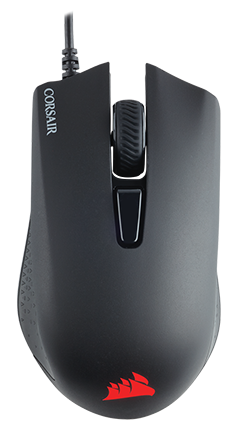 Adopting an ergonomic profile for right-handed users, the mouse takes a familiar shape with dimensions of 111.5mm x 68.3mm x 40.4mm while weight is set at 85g. It's a relatively small and dainty solution, and with no available height or weight adjustments, best suited to gamers who prefer a lightweight pointer. A largely plastic chassis emphasises the petite form factor, though well-sized rubber linings on either flank provide some much-needed grip. The Harpoon RGB feels reasonably comfortable for a mouse at this price point, though it is ultimately too small and too light for my own personal preference. I like my mouse to have a bit of heft, and this one feels almost hollow. The half-a-dozen available buttons include the main left and right clickers, a pair of side buttons on the left, a clickable scroll wheel and a DPI switcher. A rubber coating gives the scroll wheel a nice texture, but the notches aren't pronounced as much as I'd like. A stiffer action would be preferred for ultra-precise scrolling, and I've never quite become accustomed to mice with a gap in front of the wheel, creating a void between the left and right buttons. Scrolling forward just doesn't feel right when your finger ends up rubbing against two edges. Build quality is decent but not spectacular, as is to be expected at this price point, though there are one or two caveats to consider. The front edges of the main clickers are a tad sharp and can be uncomfortable for users with large hands, and if you're used to having a centrally-mounted cable, you might find it tricky to acclimatise to the Harpoon RGB's USB cable emanating from in front of the left button. It shouldn't impact usage, yet I've never quite managed to get used to it. What kind of underlying hardware can you expect for £25.99? 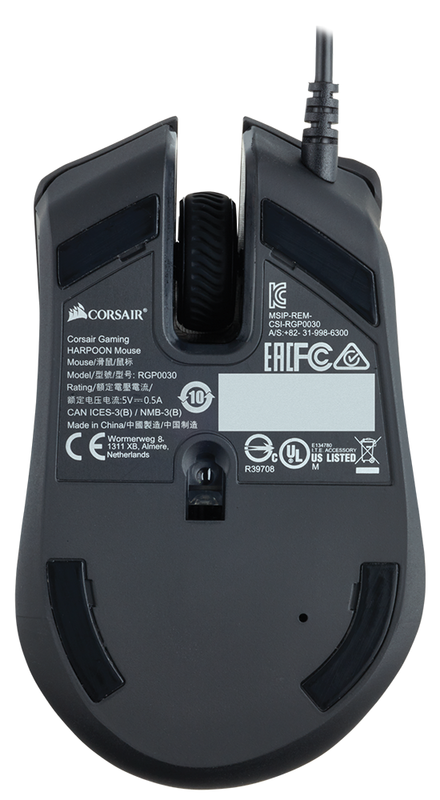 Well, the main buttons are backed by ubiquitous Omron switches, there's 128KB of onboard memory for stored settings, the rear logo is RGB backlit, four PTFE glide pads line the underside, and the brain of the operation is a PixArt PMW3320 optical sensor. The sensor can be considered low-to-mid-range, yet Corsair's implementation makes sense given the Harpoon RGB's positioning. A DPI rating of up to 6,000 provides ample precision, and the accompanying software allows for customisation in 250 DPI intervals right the way down to a minimum of 250. Polling rate, meanwhile, is set to 1,000Hz as standard and can be changed to 500Hz, 250Hz or 125Hz if need be. 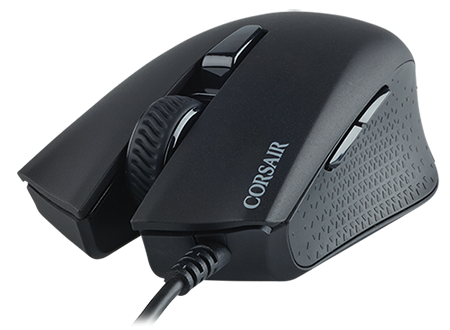 Corsair has covered most bases, though there isn't a dedicated DPI sensitivity indicator. Instead, the rear RGB logo is configured by default to change colour based on the five pre-defined DPI settings (500 red, 1,000 white, 2,000 green, 4,000 yellow, 6,000 blue). The catch, if you're reliant on a visual guide, is that the backlit logo is entirely covered by your hand during use.